That three-pound, fatty, squishy, and oddly-shaped blob in your head is truly amazing. It’s what makes you, you. It’s responsible for your personality and how we sense the world. It lets you relive memories over and over again. It gives you the capacity for language, art, and moral judgments. Your movements, day in and day out – are your brain’s responsibility. That quick scratch of the nose to relieve a pesky itch, or standing up from your couch to stretch…you can thank your brain for that. But understanding this organ isn’t so easy. There are many complex areas that are responsible for an array of functions you take for granted every day. Let’s take a look at the primary components and their primary responsibilities of the human brain. Frontal Lobe: This area is responsible for problem solving, behavior, judgment, creative thinking, smell, personality, muscle movements, physical reactions, and attention. Parietal Lobe: This lobe controls visual functions, reading, understanding language, and sensory comprehension. o Sensory Cortex: If you raise your arm above your head, you know it’s above your head. This is because of the sensory cortex. As a component of the parietal lobe, it receives information from the spinal cord on what position your body parts are in and how they move. This area also is responsible for perceiving pain and sense of touch. o Motor Cortex: Its function is in the name. This area in the parietal lobe monitors and controls movements throughout the body. Temporal Lobe: Have an incredible memory that you’ll never forget? Probably so. This is because of the temporal lobe. It’s responsible for visual and auditory memories, and also helps manage some speech and hearing capabilities. Occipital Lobe: Open your eyes and thank this lobe. This area helps to control and understand vision. Do you want to know more about your brain? Yes? Good! 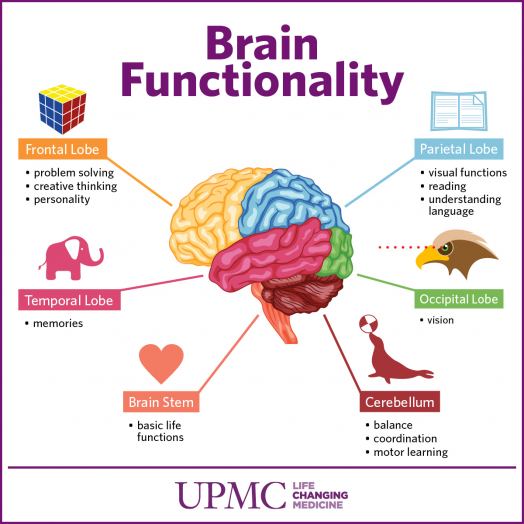 Check back to the UPMC HealthBeat blog shortly where we’ll be highlighting each section of the brain with more in-depth content. To learn more about the latest research and developments in the field of neuroscience, visit the UPMC Department of Neurosurgery online or call 1-877-986-9862 to get an expert opinion.